Technology has simplified our lives greatly and centralised many of the office functions we need to do on a daily basis. Fax-to-email is one of the many ways life has been simplified; combining the trusted medium of fax with email, saving you time and the money that you would have spent on printing supplies. 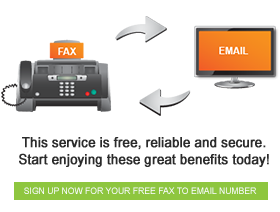 Even though many businesses rely on email to get messages across, there are instances where fax is the best option. It is not uncommon for companies to need to send legal documents that need to be signed by relevant parties to each other and to regulatory organisations, banks and insurance providers. Even though e-signatures stand legally in some instances, trying to send signed documents by email can be challenging for some people, especially if employees are not very computer savvy. In many countries the use of digital signatures is not recognised as being valid, instead you would be required to sign documents and scan them, then send them electronically. This is because there is nothing stopping a person from automating a digital signature on the computer without the receiver knowing if it was authenticated by the legitimate owner of the signature, whereas it would be more challenging to fake a physical signature. This is one of the many reasons why fax-to-email still stands and may be around for many more years to come.